"The gift arrived on time and the people who received it said it was wonderful. I will certainly order from them again". Make scrumptious Cobblers with fruit and flavorful filling that you can make in five minutes just by adding butter and water. The colorful, hand-painted, fruit-shaped stoneware baking dishes, complete with coordinating baking mixes make stunning gifts. The stoneware baking dishes are microwave, dishwasher and oven safe. 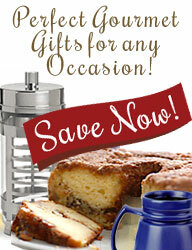 Choose from quick and easy baking mixes with coordinated baking dishes. Select from Cherry Cobbler, Apple Crisp, Peach Cobbler and Pumpkin Cobbler.